This version of the Q450 features Integrated PCB Version features integrated PCB connections for direct soldering of your ESCs. This eliminates the need for a power distribution board or messy multi-connectors keeping your electronics layout very tidy. Assembly is a breeze with pre-threaded brass sleeves for all of the frame bolts, so no lock-nuts are required. It utilizes one size of bolt for the entire build, making the hardware very easy to keep in order and only requiring one size of hex wrench to assemble. A great feature of this frame is the large mounting tabs at the front. It Contain colored arms (2 white and 2 red) which are great for orientation. It helps to keep you flying the right direction without the need for different colored props. 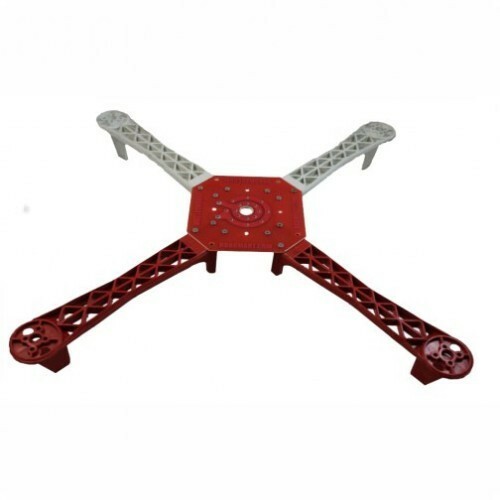 We offer a full line of multi-rotor electronics such as multi-rotor control board, ESC & motors. It has never been easier or more affordable to get a quad in the air! Built from standard quality glass fiber and polyamide nylon.